For the last few days, it's been turkey leftovers at my house...everything from the traditional platter, to turkey pot pies, and of course lots of turkey sandwiches! Thanksgiving really is my favorite holiday of the year for this reason. 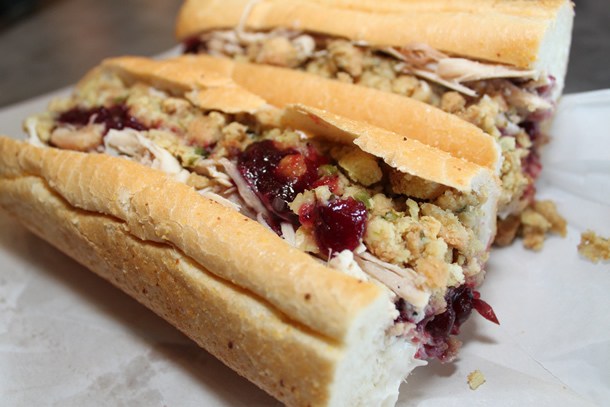 I LOVE turkey sandwiches with stuffing, cranberry sauce and mayo! Often during the year, if I hear about a good turkey sandwich I'll have to try it. I love the turkey sandwich at McNally's Tavern outside of Philly (love the name too! ;-). 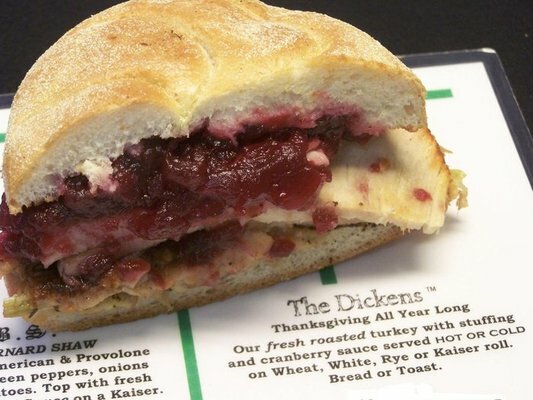 McNally's Tavern is home to The Dickens- their version of Thanksgiving All Year Long with turkey and cranberry sauce (ask them to add mayo if you like)...it's delicious! Now, as I start to think about planning my annual winter trip out to L.A., California, I am adding Capriotti's in Beverly Hills to my list of places to try. This place is known for its Bobbie- a nationally acclaimed best seller that has homemade turkey, stuffing, cranberry sauce and mayo on it. This looks like one mean turkey sandwich and it has my name written all over it. Watch out Bobbie...you are going down! Have any more L.A. food suggestions? Jet Set Smart would love to know about them! By the way, the answer to the "Think You're a Jet Setter Prove It" post from Tuesday is The CN Tower in Toronto! Congrats to those who got it. Jet Set Smart is working on a giveaway for the next "Think You're a Jet Setter Prove It" post...stay tuned!